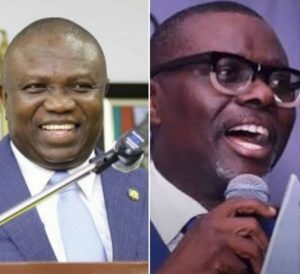 Lagos state governor, Akinwunmi Ambode, has said that Babajide Sanwo-Olu, his opponent in the race to secure the ticket of the All Progressives Congress (APC) in 2019, is not fit to fill the position of a governor. Addressing a press conference at government house, Alausa, Ikeja, on Sunday, Ambode said Sanwo-Olu was arrested for spending fake dollars in the US. He also said Sanwo-Olu underwent rehabilitation at Gbagada General Hospital in Lagos. Appealing to the leadership of the party in Lagos to “do the right thing”, Ambode said Sanwo-Olu is being pushed to do what he is not capable of. “We have never responded to the campaign of calumny on social media. We have one family in APC. The aspirant being put up to compete against us is not a fit and proper person to take this job,” he said. “I have done everything in the last three and half years to serve people selflessly and to serve the poor. “This particular aspirant is somebody that has been arrested for spend fake dollars in a nightclub in America, and he has been detained for months. “He doesn’t have the competence to do what he is being propelled to do. This is somebody that has gone for rehabilitation before. The records are there at the Gbagada General Hospital. We don’t want to go to far. Our leadership should have a rethink. Who Has Found This Missing Lady? !